I had been reading about the comeback of non-hydrogenated coconut fat and so decided to try making the pie crust with coconut fat instead of lard, shortening or my usual favourite, butter. Thus the pie was vegan for no other reason than I was curious. 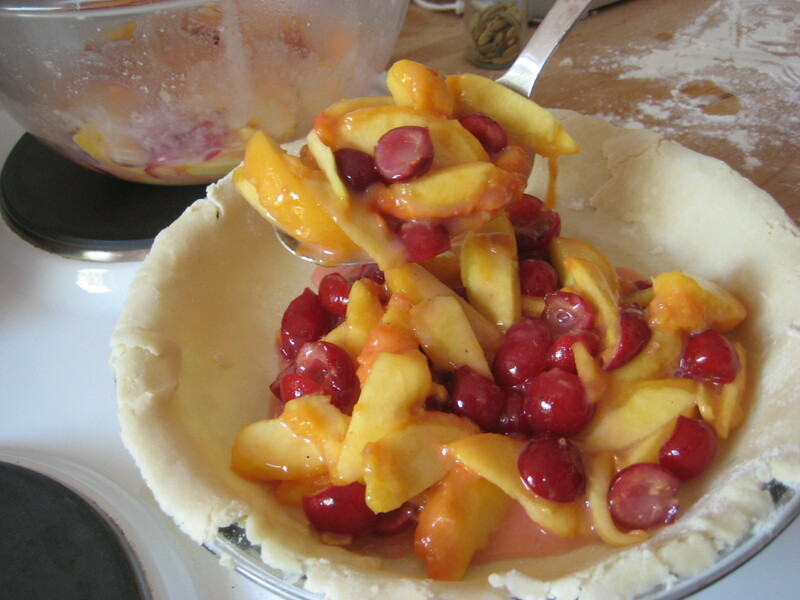 You can do worse than follow the Joy of Cooking’s instructions for fruit pies. 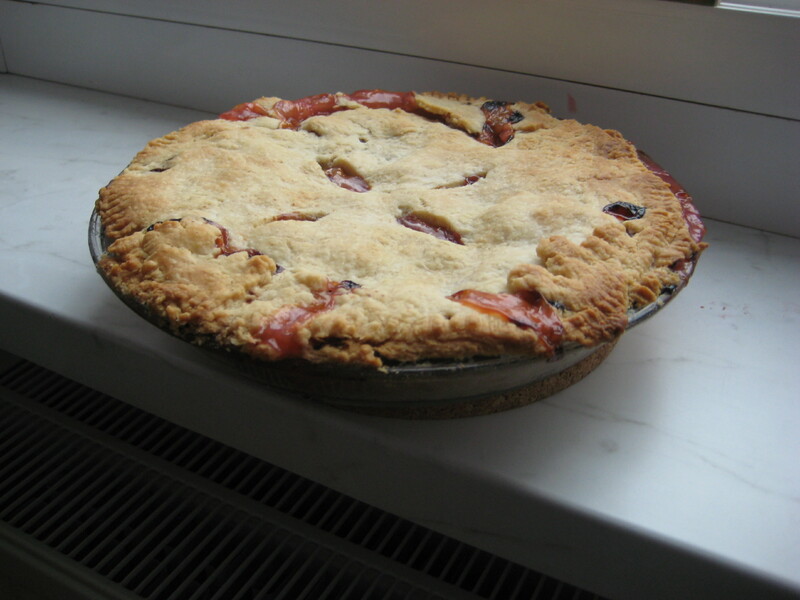 In short, you want five cups of fruit for a pie. For flavour inspiration, I turned to epicurious. At the market that morning, I had already bought a beautiful pint of sour cherries and some ok looking peaches. Turned out to be just enough for five cups of fruit. Some sugar, some cardamom, some vanilla, 3 tbsp of flour, and ta-da pie filling. Yes, this is how I bake. 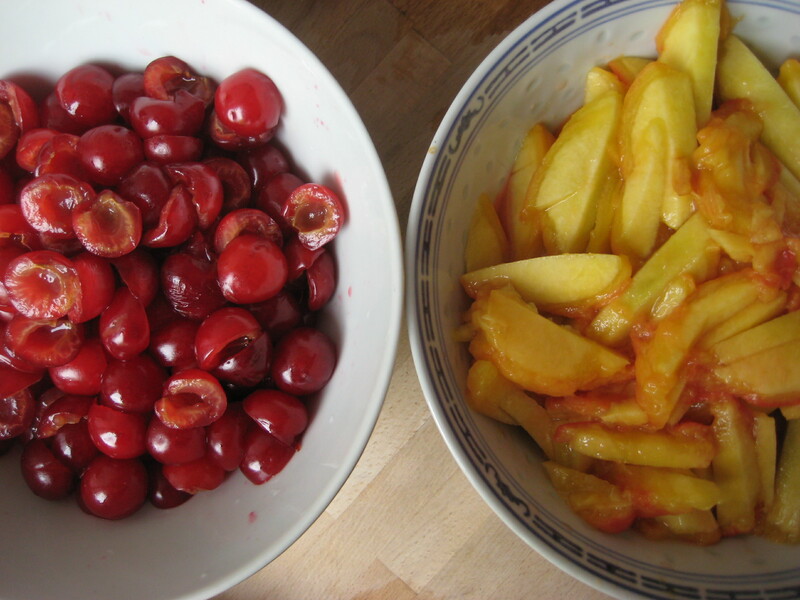 The brawn behind the operation: Sebastian pitted the cherries. Coconut oil melts really quickly. I had to work quickly both when blending the pastry and when rolling it. I wasn’t entirely successfully rolling out the top and I ended up putting the dough back in the fridge and rolling it out again. Not the most beautiful pie crust. Ignore the front part. 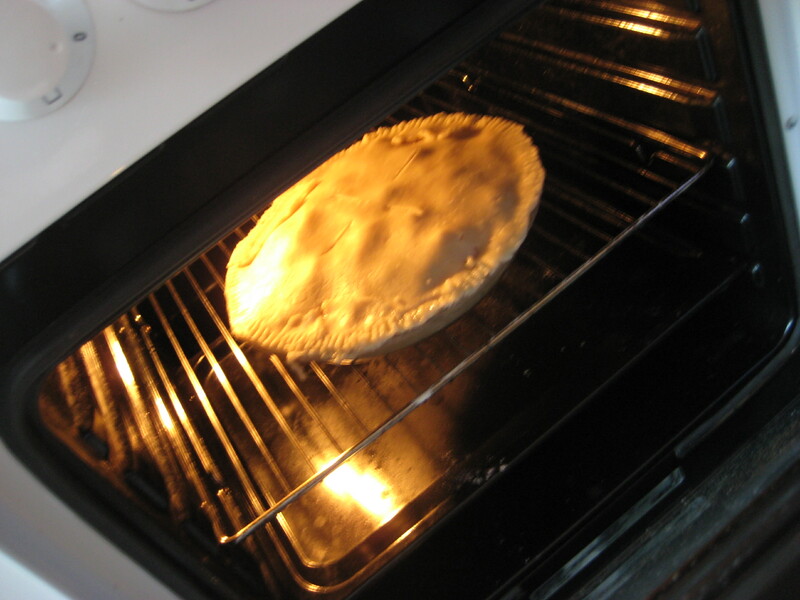 I used a slotted spoon to scoop the filling into the crust so that the pie would not end up too runny. The pie was delicious. 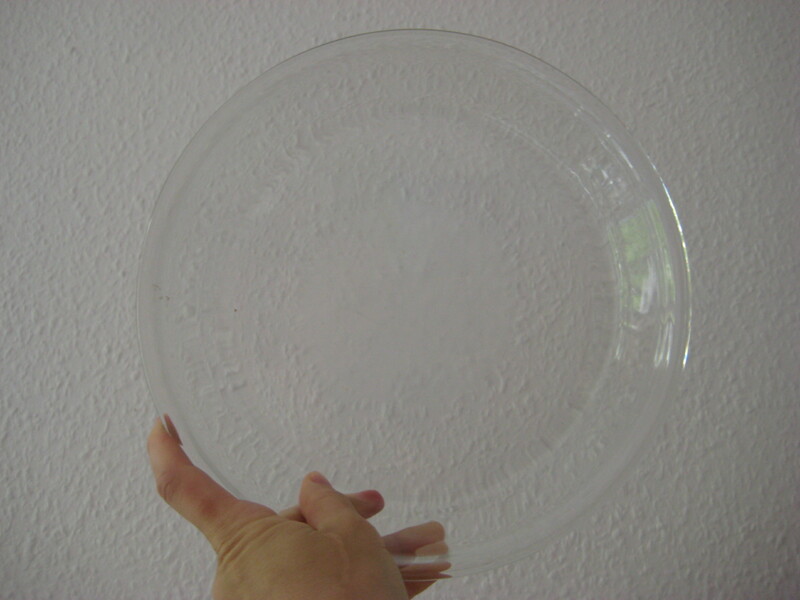 The crust was flaky and light – and did not taste of coconut. Four of us had healthy portions of the warm pie. It tasted great warm and the leftovers were devoured for breakfast the next day. Homemade pie for breakfast is sublime. I’m not sure I’m ready to compete with the Pie Factory but it’s a start. OMG sour cherries! I’ve been craving them so bad. I saw them at the store last week (which was weird—they shouldn’t even be in the store here) for $6 for less than a pint. It basically looked like 150g max. We do have plenty of cheap peaches though! They were really good and a good price but after that one time I never really saw them again at the market. Peaches right now are really good and as cheap as they ever get. Bet your peaches are stil better though. If it weren’t so damn hot, I’d consider making a peach cobbler this weekend. Hey Ladies, check out the nice apron I’m wearing in that picture.